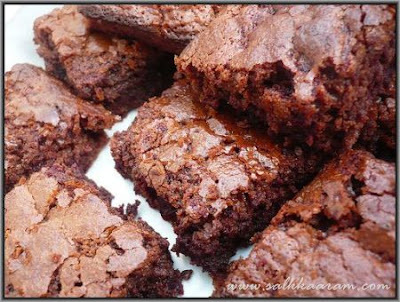 Homemade Chocolate Brownies | Simple and Delicious ! As most of you know I’m not that fond of baking, but I love to treat myself at the bakery once in a while. However, some baking recipes can be so easy that you really don’t need to be a top chef with restaurant insurance to make them, and they are also crowd pleasing. One of these is homemade chocolate brownies, which can be nicer than bought in the shop as you get the delicious smell around your house, the warmth and satisfaction of baking it yourself. Your kids will also enjoy baking (and eating) them too! If you are interested in making these, then read on. 1. Preheat the oven to gas 4/180c/fan 160ci and grease and line a 20cm cake tin/baking tray. 2. Place the golden syrup, chocolate, brown sugar, butter and caster sugar in the pan and melt on a low heat until its lump free and smooth. 3. Once smooth, remove the pan off the heat. 4. Crack the eggs into a bowl and whisk until frothy and light. 5. Next, add the vanilla extract, eggs, baking powder, flour and cocoa powder to the chocolate mixture and mix thoroughly. 6. Put the mixture into the greased cake tin/baking tray and place in the middle of the oven for about 25-30 minutes. 7. Remove from the oven and allow to cool for about 15-20 minutes before cutting into 6/8 portions (be careful of little hands that are eager to eat them!). You could serve the yummy brownies with cream or ice cream and lots of fresh fruit! Looks so yummy. Love to have a bite. Cool, I like ur touch simple yet sophisticated foods. AND KIDS LUV IT, NOT EXACTLY SOMETHING U FIND EVERY DAY!!!!!!!! !